Smitty Harris was born in 1929 in Parkersburg, West Virginia. He enlisted in the U.S. Air Force on January 2, 1951, and made Sgt before entering the Aviation Cadet Program on August 10, 1952. Harris was commissioned a 2d Lt and awarded his pilot wings in September 1953, and then completed advanced flight training in the T-33 Shooting Star and F-84 Thunderjet. His first operational assignment was as an F-86F Sabre pilot with the 45th Day Fighter Squadron at Sidi Slimane AB, French Morocco, followed by service as an instructor pilot at Greenville AFB and then with the 3306th Pilot Training Group at Bainbridge AFB, Georgia, from January 1956 to August 1960. 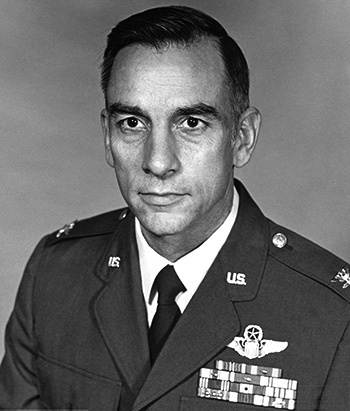 Capt Harris then served as Chief of the Promotions and Flying Status Branch at Headquarters Air Training Command, Randolph AFB, Texas, from August 1960 to November 1962. His next assignment was flying F-100 Super Sabres and then F-105 Thunderchiefs with the 561st Tactical Fighter Squadron at McConnell AFB, Kansas, from November 1962 to November 1964. Capt Harris transferred to the 67th Tactical Fighter Squadron at Kadena AB, Okinawa, in December 1964, and began flying combat missions in Southeast Asia in March 1965. He was forced to eject over North Vietnam while flying his 6th combat mission on April 4, 1965, and was immediately captured and taken as a Prisoner of War. After spending 2,871 days in captivity, he was released during Operation Homecoming on February 12, 1973. Col Harris was briefly hospitalized to recover from his injuries at Maxwell AFB, Alabama, and then he remained at Maxwell to attend the Air War College there from August 1973 to August 1974. He remained on the faculty as Chief of Curriculum Planning until his retirement from the Air Force on July 31, 1979. After retiring from the Air Force, Smitty completed law school and joined the Mississippi Bar in December 1981. He and his wife Louise have three children. Smitty Harris was the 3rd Air Force pilot shot down and taken as a Prisoner of War during the Vietnam War. For the Period March 1968: This officer distinguished himself by gallantry and intrepidity in action in connection with military operations against an opposing armed force during the above period while a Prisoner of War in North VIetnam. Ignoring international agreements on treatment of prisoners of war, the enemy resorted to mental and physical cruelties to obtain information, confessions, and propaganda materials. 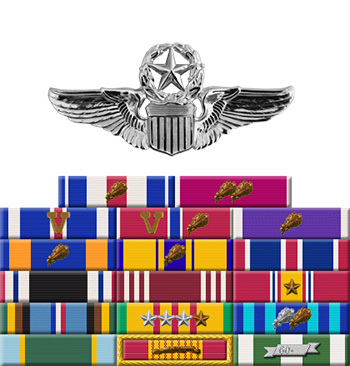 This individual resisted their demands by calling upon his deepest inner strengths in a manner which reflected his devotion to duty and great credit upon himself and the United States Air Force.